Finally! The mango tree with an uber big branch that has been leaning towards the garden and fish pond for almost 4 years now has been chopped-off. The mango tree used to stand straight and tall but a really nasty typhoon almost uprooted the tree thus left it leaning at less than 45 degrees from the ground. Hubby finally consented to have that one offending branch rid off. Now I can go about sprucing-up that part of the garden. Speaking of sprucing-up the garden, I also need to seriously consider renovating my bathroom. It has this really small glass tiles popular in the 70s and 80s. 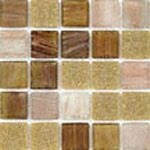 This type of tiles is no longer available in locally but there are a few home depot that carry imported ones. I saw this one online and this will look great in my bathroom.